The Carrier, Personnel Half-track M3, also known as the M3 Half-track, was an American armored personnel carrier widely used by the Allies during World War II;and in the Cold War. Derived from the M2 Half Track Car, the slightly longer M3 was extensively produced, with about 15,000 units and more than 50,000 derivative variants manufactured (most of which were interim designs). The M3 and its variants were supplied to the US Army and Marines, as well as British Commonwealth and Soviet Red Army forces, serving on all major fronts throughout the war. This is a 2-sprue base kit for the M3 Half-track. 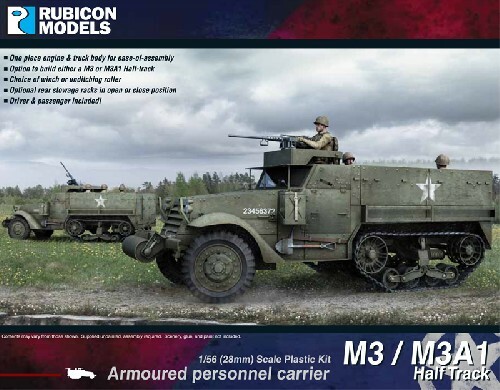 It comes with choices to build either a M3 or M3A1 version. Other options included a Tulsa Model 18G winch, unditching roller, open or closed rear stowage racks with metal boxes, front armoured louvers in open or close position, and various machine gun (both MMG and HMG) choices. Driver and passenger included!